“At Creation we love visitors and the increasing number of wine lovers finding their way to our little piece of paradise is rewarding indeed.” This statement by Creation’s Carolyn Martin only hints at the great experience awaiting visitors to the scenic estate on the Hemel-en-Aarde Ridge near Hermanus. Over recent years the estate has welcomed an ever-increasing number of visitors, with guests commenting on the ‘wonderful location’, ‘fantastic wines’, ‘immaculate service’, ‘exquisite cuisine’, ‘very knowledgeable and charming staff’ – to mention but a few aspects regularly highlighted on TripAdvisor and other platforms. The team’s proactive attitude towards wine tourism goes much further than luring visitors to their own piece of paradise. “Every visitor to the Cape Winelands creates a number of job opportunities whilst visiting and at Creation we regard it our duty and privilege to play an active role in promoting our area as well as the wider Cape Winelands. That’s why we have made it our business to find out what the contemporary wine lover expects from his/her wine experience,” remarks Carolyn. Click here to read the complete blog and here to order our award-winning wines online. Set amidst the vines and perched high up on the Hemel-en-Aarde Ridge (meaning heaven on earth) near the coastal town of Hermanus is where you’ll find the gem of the valley. Click here to read the complete article by Brittany Hawkins. This year’s Hermanus FynArts takes place from 9 to 18 June and promises to be a feast of exhibitions, presentations, performances, workshops, films and of course food and wine. According to Creation co-owner and marketing director Carolyn Martin the Creation team looks forward to partaking in this annual event, offering not only an art exhibition but also a magnificent spread of food and wine. “Fine winemaking is of course an art in itself and as dedicated supporters of the arts, we are proud to participate in this joyous festival again,” says Carolyn. Hermanus FynArts is hosted in assorted venues in and around the coastal town of Hermanus – one of them being Creation Wines where the estate will be exhibiting a truly exciting installation of sculptures by the acclaimed artist Willie Botha. Click here to read more about Willie and his work. A highlight of Creation’s participation will be a three-course dinner specially prepared by the Creation Culinary Team to harmonize with three of Creation’s award-winning wines. There will be music to match and this rare celebration of food, wine and music titled Food as Art will take place on Thursday 15 June 2017 at 18h30 at the Creation Wines Tasting Room. Tickets are available at R550 per person and bookings can be made by contacting Claudine at claudine@creationwines.com. For more information on Hermanus FynArts click here. Europe and UK here we come! May 2017 will see Creation’s JC and Carolyn Martin visiting selected venues in Europe and the UK. Carolyn looks forward to hosting private client and sommelier tastings in Denmark and then in the UK with JC. Among the events in Scotland will be a tasting at House of Turin and a private dinner at Champany Inn, Edinburgh. Then to London, which includes a private tasting on 17 May. While JC does trade visits in Switzerland and Germany, Carolyn will be spreading her wings to visit Tallinn, Estonia. More information on their whereabouts, the exact dates and venues will follow next week. 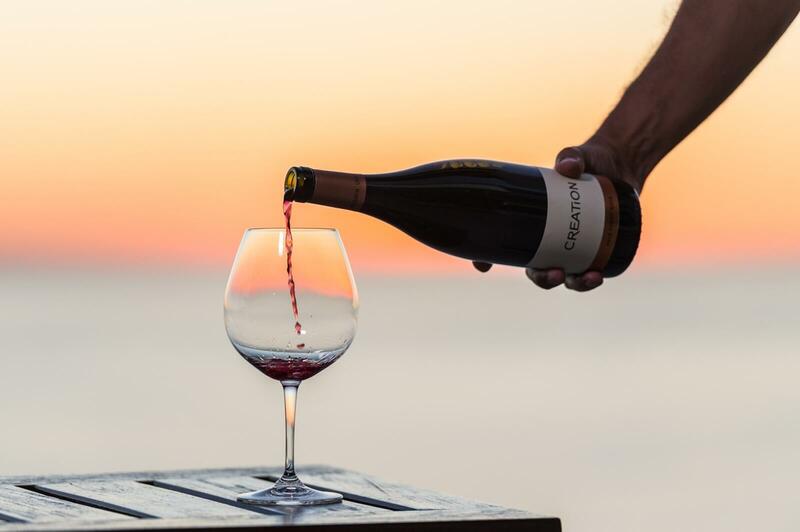 Good news for Pinot lovers flying British Airways during the month of May: The Creation Pinot Noir 2016 has been selected to be served on BA First Class on their Tier 1 routes. Among others these include Cape Town, Johannesburg, Hong Kong, Singapore, New York, LA and San Francisco. On a recent visit to Hermanus and Gansbaai we were fortunate to discover the food and wine pairing lunch at Creation Wines in the Hemel-en-Aarde Valley between Hermanus and Caledon. It was an awesome experience with excellent wine, food and service from very knowledgeable staff. We did the 8 course tapas food and wine pairing. The portions are small but excellent and paired with the perfect wines for each course. Be sure to give yourself a few hours to relax and enjoy the experience as this cannot be rushed. We were also blessed with the most beautiful sunny and windless weather which made our experience of the valley unforgettable. A must visit on your next trip to this part of the country. Great news for Creation lovers: we are now available on WhatsApp! For all bookings, other enquiries and wine orders, feel free to contact us on 082 921 6435 if this is your preferred method of communication. 29 April 8h00 – 12h00: Creation at the Hermanus Country Market, Hermanus Cricket Club A small market with a lot of soul where good friends meet hug and eat … You can look forward to an amazing array of fresh organic produce, homemade delicacies, artisan breads, probiotic yoghurts, handmade cheeses, home-smoked fish, happy hen eggs, wheat-free bakes and local wines. For more information click here. 15 June 18h30: FynArts Dinner at Creation Tasting Room Food as Art will take place on Thursday 15 June 2017 at 18h30 at the Creation Wines Tasting Room. Tickets are available at R550 per person and bookings can be made by contacting Claudine at claudine@creationwines.com. 11 May 2017, 18h30 – 21h30: Slurp South African Wine Tasting, South Africa House, London Join us for a very special evening of South African wine tasting at South Africa House in London. This will be a unique chance to taste and purchase some exceptional wines, hand-picked by the Slurp team and Sally Easton, Master of Wine. Taste big reds and crisp whites as well as refreshing sparkling wine and a selection of dessert wines – there’s so much to try! Tickets are available at £25. Click here to buy a ticket.